The terrace at the W offers stunning views. Find the perfect blend of oceanside tranquility and beachside vibrancy at W Fort Lauderdale. 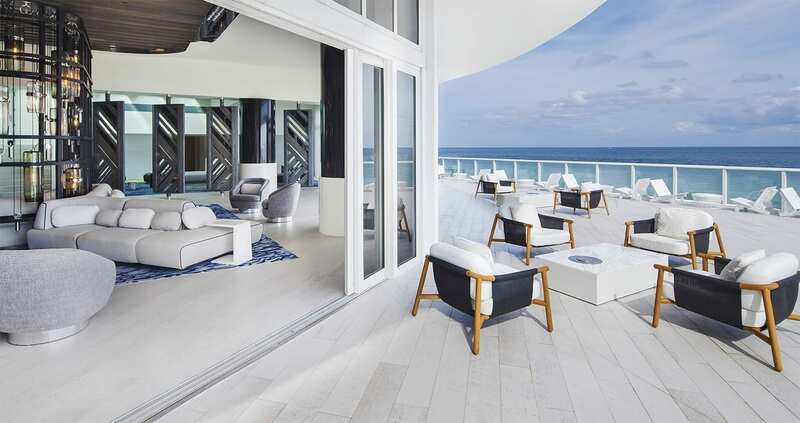 Boasting of being the largest W in the country, the haven sits along 315 feet of North Beach’s white sand paradise. Experience laid back luxury in the Living Room, which leads to an outdoor terrace offering stunning views. Situated alongside the Room is the SUSHI Bar where guests can savor some fresh catch while enjoying a down tempo chill atmosphere. Sushi Chef Shoji Hiyakawa, a protégé of Iron Chef Masaharu Morimoto, brilliantly designed the menu offering culinary delights as steamed lobster with creamy avocado. The dining, simply put, is decadent. Indulge in superb entrees at Steak 954 where chic ambiance and succulent cuisine make it a top notch dining experience. It is some of the best dining along the North shore. The blue glow of the jellyfish aquarium illuminates the cozy interior. Here is a cheat sheet on what to order. Kick things off with the bigeye tuna & foie gras tacos or lobster & crab coconut ceviche. Both sea to table apps are divine. The tacos consist of thick, seared cubes of tuna with avocado salad and chipotle aioli. For a salad, a must is the baby beet salad, which presents as an art piece. It’s a harmonious blend of flavors with goat cheese, whipped creamed cheese and vinaigrette. These dishes are just a foretaste of the entrees and sides to select from. Steak steals the show at 954 where succulent dry aged beef mandates a pause with every bite. Savor a prime 40 day aged ribeye or NY strip. Compliment the meal with smoked cauliflower and kale or truffled potatoes au gratin. Save room for dessert as the chocolate souflee. Release all tension and rest in tranquility at the Bliss Spa. The ginger scrub includes a full body wrap and scrub followed by a massage. It is brilliantly designed to offer circulatory benefits and offers divine comfort from the hands of a highly skilled masseuse. Grated ginger is heated, providing natural benefits as it detoxifies the body and increases circulation. W Fort Lauderdale is a convenient 20 minute drive from Fort Lauderdale-Hollywood International Airport. On land or water, there are plenty of adventures in Fort Lauderdale outside of W’s nightly programming. Fort Lauderdale has become known as “The Venice of America,” with transport from The Water Taxi, a trolley-on-the-water that makes stops at some of the area’s can’t-miss spots. Take a one hour segway ride through the scenic Hugh Taylor Birch State Park. A freshwater lagoon weaves through the trees. For more information, visit https://www.segwayfortlauderdale.com. Anchor up and head out to sea through the Sea Experience, which offers dive and snorkel trips. All ages will enjoy the clear South Florida waters and exploring what lies beneath. Visit http://www.seaxp.com. For an enlightening shopping experience, check out Las Olas Boulevard and enjoy seventeen blocks of diverse shopping, sidewalk cafes, international acclaimed art galleries and fine dining. Seeking a nature getaway with thrilling views? Check out nature’s most prehistoric creature, the alligator along with exotic birds within the Florida Everglades, just 30 minutes away. Explore the cultural side of Fort Lauderdale at the NSU Museum of Art which showcases more than 6,000 works, including celebrated holdings by the postwar avant-garde European Cobra artists, the nation’s largest collection of works by American painter William Glackens, and a special focus on photography through its Foto Fort Lauderdale initiative. Visit NSU Art Museum Fort Lauderdale | Providing exceptional opportunities to access, learn and be inspired by the highest level of art throughout time and from around the world.